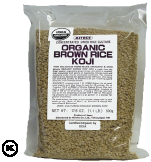 Natural Import Company - Traditional Japanese foods - Mitoku OG Brown Rice Koji - 17.6 oz. Mitoku OG Brown Rice Koji - 17.6 oz. Ingredients: Japanese organic cultured brown rice. Koji is the natural inoculator for making miso, shoyu, natto and many other Japanese specialty fermented foods. Mitoku Organic Brown Rice Koji is handmade from selected certified organic whole-grain brown rice, which is steamed, then inoculated with spores of Aspergillus Oryzae and incubated under strictly controlled conditions. The resulting koji is left to develop for approximately 48 hours, then taken out and quickly dried in order to preserve it for use in making the finest amazake, miso or koji pickles, etc. Made in small batches by the Marukura Family.